A free weekly newspaper covering portions of southeastern Jefferson County is shutting down. The last issue of the Columbine Courier — which has reported on communities, including Columbine and Ken Caryl, since about 1990 — will be Dec. 27, according to Kristin Witt, publisher of Evergreen Newspapers. In addition to the Columbine Courier, Evergreen Newspapers also publishes The Canyon Courier, which covers Evergreen and surrounding communities, and the Clear Creek Courant, which covers Idaho Springs and Georgetown. The company is part of Kentucky-based Landmark Community Newspapers. The Columbine Courier runs advertisements, but Witt, who has been in her role for about 1½ years ago, said the title has been unprofitable for years. Witt said the title has made progress on that front during her tenure, and is “very close to break even,” but that Landmark executives made the call to discontinue it. 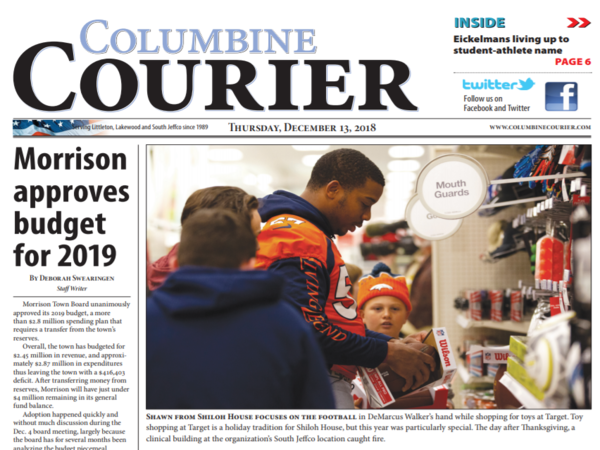 The front page of the Columbine Courier’s most recent issue, published Dec. 13, features stories on the town of Morrison approving its 2019 budget and Denver Broncos defensive end DeMarcus Walker going on a holiday shopping spree with kids from Shiloh House, a Littleton nonprofit. Witt said readership has been strong. Staff put out about 10,000 issues on racks each week, and typically end up bringing back about 200, she said. The two reporters who wrote for the Columbine Courier will remain with the company, filing for the other publications. Witt said some Columbine Courier readers have expressed disappointment that the title is going out of print, and she’s exploring having The Canyon Courier report on the area. Witt said The Canyon Courier already reports on county issues, which are relevant in both Evergreen and Columbine. But to justify covering more local issues, a sizable chunk of Columbine-area residents need to subscribe to the Evergreen paper, she said. Most other community newspapers in the Denver metro area are owned by Colorado Community Media, which purchased two Denver neighborhood newspapers this year. Another neighborhood newspaper shut down last December.